I’ve never understand why these things were started, or what they actually mean in the sport of NFL football. I’m talking about Power Rankings. Myriad websites and newspapers rank NFL teams from 1-32, like this actually means something. They do this periodically in the off-season and weekly during the season. They mean nothing, but people seem to eat them up. Clearly many people are easily distracted by meaningless stuff these days. NFL Power Rankings are pretty foolish during the season, but exceedingly foolish in the off-season, when all teams are undefeated, and haven’t played any games yet. Pro Football Talk’s Mike Florio has the Jets ranked 32nd. I’m sure he won’t be alone. Can somebody explain to me why these are done or why people care about them? NFL Power Rankings are a waste of time. This isn’t college football where rankings matter. 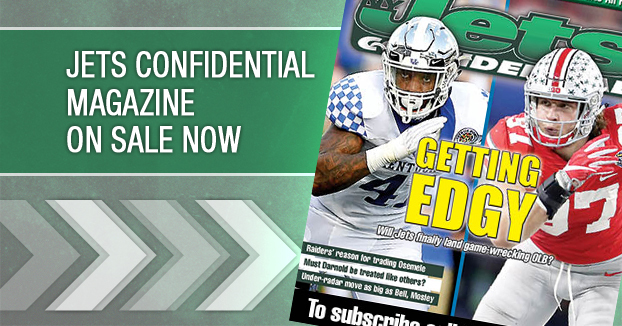 *****The new issue of Jets Confidential is on news stands – an unfiltered look at every Jets position group entering training camp, and so much more. To subscribe click below, or call 1-800-932-4557 (M-F, 9-5). Great beach reading!